Julene Tripp Weaver lives in Seattle where she has a counselling practice. Her first full-size poetry book, No Father Can Save Her, was published this year by Plain View Press. She has a Bachelor’s degree in Creative Writing from the City University of New York and a Masters in Counseling. Her first chapbook, Case Walking: An AIDS Case Manager Wails Her Blues, has a selection of her poems written during her 18 years working in HIV services. She is widely published in journals and anthologies. She does wordplay on Twitter @trippweavepoet and has a website where you can read more of her writing. As a young teen I wanted to write poetry. Now I understand my desire to write was from my grief. My father had a long slow illness, and he died from Hodgkin’s cancer when I was almost 12. Left with an unstable mother, who I never related to, I had to make sense of the world. Writing was a way to save myself. My books have to do with the aftermath of grief, one personal, the other from a major epidemic that has transformed our world. In both I sought a way to understand, to come to peace, to leave a legacy. 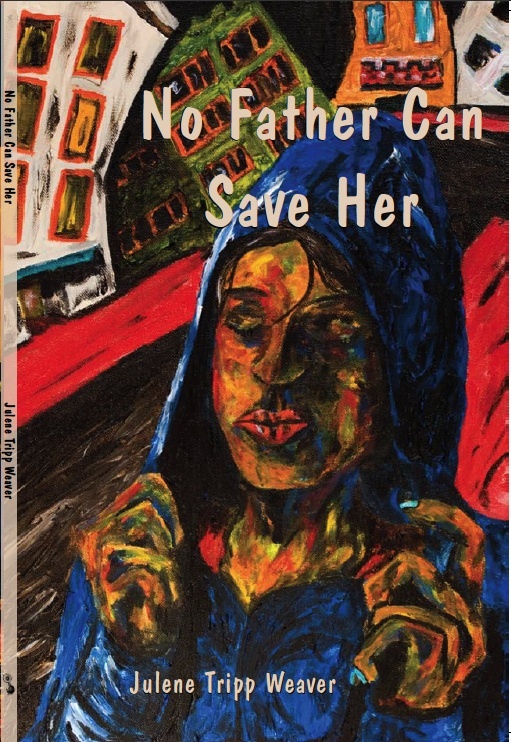 My poetry book, No Father Can Save Her (Plain View Press, 2011) is biographical, mostly narrative poems about coming of age after my father’s death. This book has been in process since I started writing. In this biographical poetry book, I’ve explored issues of sexuality through the time of the sexual revolution. My first chapbook, Case Walking: An AIDS Case Manager Wails Her Blues (Finishing Line Press, 2007) is dedicated to all who have died from AIDS and all who continue to survive. In this book from my work in an urban AIDS Service Organization I’ve documented lives of the bereft with elegies and used the writing as a way to address the secondary trauma one experiences doing social work. I wasn’t exposed to poetry as a child, but I believed I could write. At 15 I signed up for an evening poetry class at a local college. My uncle had to drive me, and he did not approve. I went prepared with a poem, but I was young and intimidated by a room full of poets; I never went back. Perhaps if my uncle had been supportive, or if I weren't so dependent on him to commute, I might have continued. But the timing wasn’t right. Most of my early writing was in journals. Later in my teens my uncle read my diary, a violation that stopped me from writing for years. It took me till I was in my mid-20s living in NYC to start writing again. I joined a poetry critique group, volunteered at a writing program, and joined the Feminist Writers Guild. This involvement inspired me to go back to school for my undergraduate in Creative Writing at the City University of New York. My main school was Hunter College, which I picked because Audre Lorde taught there, and I could take a course at Brooklyn College with Joan Larkin. What is the primary source of inspiration for you? · Reading other poets and hearing them read their own work. · Internal emotions stirring inside me. · A yearning to understand more about a situation or my past or my present state. · A deep desire to honor the dead. My poem in the anthology, Wait a Minute, I Have to TakeOff My Bra, is to honor Negesti, a poet who was a warm and welcoming person. She supported and encouraged many writers. · A desire to make a difference in the world. · A desire to leave a legacy for myself and others. Do you write when the muse strikes, or do you follow a writing schedule? I write in my journal. I do not keep a regular schedule. Writing waxes and wanes; I’ve gone through long periods where I’ve not focused on writing and long periods where I’ve been obsessed to write. Now that I’ve had the good fortune to have two books accepted and published, I’ve discovered when I’m promoting a book it is difficult to focus on writing. I’ve learned to respect the energy flow, learned to make room for writing when it comes. To write requires living in a space that accepts and honors imperfection. Much like dreams where if you acknowledge what comes more will unfold. It is important to welcome the words when they arrive, because that will evoke more words. Since it is impossible to get what is in our minds onto the page, because our minds travel so much faster, we must take what comes and then work to improve it. I love William Stafford’s writing about writing. In one book he describes his process: waking early, lying on the couch, and in that semi awake space he picks a string from the air and follows it. I start writing this way. Follow what is in front of me to where it leads. Or start internally and bring it out like a tread on a needle. Reading books about the writing process is inspiring: books by William Stafford, Richard Hugo, Charles Simic, Anne Lamott’s Bird By Bird. Years ago I read Peter Elbow and Natalie Goldberg’s books. I’ve worked with movement and writing through Continuum Movement, one of the early bodywork practices. Emilie Conrad, the founder, runs a writing and movement group with writer Rebecca Mark; it was called Poetry in Motion for years, now it’s called Writing the Waves. My first Continuum Movement intensive was in 1988; in 1996 I experienced my first Poetry in Motion. It was there the first seed of my first book, Case Walking, started. This work creates a cauldron of writing energy. Soon after this workshop I started running classes I called Muse to Write. A Tombow brush stroke marker is used, it has a near brush stroke at its point. As our writing comes through our nervous system every mark on a page carries our imprint. This work is hand-to-page exploration that allows art to evolve from basic marks into images into words from our very cells. It is ancient. Group writing is amazing, it is a way to witness and be witnessed, a place to hear your words read out loud, expressed from different angles and different places in the body. When we read back, we sound not only the words but the marks and lines on the page. I’ve come to learn the work I’ve taught falls into the realm of Transformative Language Arts, a course of study developed by Caryn Mirriam-Goldberg at Goddard College. It brings writing to people who may never go the route of the professional writer but who do it for purposes such as healing or self-knowledge. There are many reasons people write. I’ve taken many classes. In Seattle we have the Richard Hugo House, a rich resource for writers. Teachers like Deborah Woodard or Elizabeth Austen provide assignments to read writers and write. With Deborah I’ve worked with the writings of Gertrude Stein, Allen Ginsberg, Elizabeth Bishop, Emily Dickinson. Elizabeth Austen did a three-year monthly series where we read and responded to a new book each month. I also did Elizabeth’s revision class and a title class. Getting words to the page is a first step. If you want to publish then revising is important to capture and keep the reader’s attention. We must make our words sing, so I’ve sought out writers to form peer critique groups. Doing a combination of classes, readings, attending poetry events, fostering continual improvement is my process. What have you done to promote yourself as a writer? As a writer it is important to learn the business of writing. This includes sending your work out to journals and anthologies, starting a mailing list to develop a following, crafting groups of poems into manuscripts. I post notices on Facebook and Twitter when I am published. Attend and read at open mikes, schedule feature readings. Network with local poets. Make MP3s of my poems using music and sound effects. · Develop new obsessions to feed my writing. · Form my next book. · Expand into new forms. · Develop my fiction writing. · Do a broader public reading circuit. When did you discover your unique voice? How long did the process take? Voice changes through time—it is a growth process. My voice as a teen trying to write was small. I became an outraged voice for feminism in my 20s. I became a confessional-exposing-secrets voice, which is in my book No Father Can Save Her. I’ve been a voice for the oppressed and for those who suffer, as in my book Case Walking. The voices brew and churn and circulate. I wait and watch and listen to what voice comes. We change. I don’t believe we have one voice; I believe we have many. What do you consider your greatest achievement as a writer? · Having two books chosen and published by editors who believed in my writing. · Having great cover art on both of my books. Case Walking has a photo that I found in NYC at the beginning of the AIDS epidemic. In No Father Can Save Her the artwork is a perfect match for the poems, and there is a photo of my Dad and me inside the cover. · Having a circle of friends who love my work. The new famous is having 15 fans, and I easily have 15 wonderful fans. · Having a poem from Case Walking featured on Garrison Keillor’s The Writers Almanac and having it published in his newest Good Poems American Places volume. Jeremy Halinen’s book of poetry released this year, What Other Choice, and Judy Allen’s first novel, also released this year, Looking Through Water. Who are the writers you admire most? There are so many. Some of my strongest inspiration came from poets I read when I was deeply immersed in the feminist movement in New York City in the 1980s: June Jordan, Nikki Giovanni, Sonia Sanchez, Judy Grahn, Audre Lorde, Adrienne Rich, Pat Parker, Lucille Clifton, Joan Larkin, Sharon Olds, Faye Kicknosway, and Wanda Coleman. It’s hard to name people because someone is always left out, but others include: Eileen Miles, Jan Beatty, Penelope Scambly Schott, Lana Hechtman Ayers, Patricia Smith, Camille T. Dungy, Elizabeth Austen, Pat Fargnoli, Belle Waring, Dorianne Laux, Eloise Klein Healy, Deborah Woodard, Tory Dent, Tim Seibles, Afaa Michael Weaver, Reginald Shephard, Major Jackson, Brooks Haxton, Tom Gunn, Philip Levine, Jericho Brown, Terrance Hayes, Mark Strand, Michael Ryan, William Stafford, Russell Edison, Marie-Elizabeth Mali, and her husband Taylor Mali. As for fiction my favorite writer is Tom Spanbauer; I’ve immersed in his Dangerous Writers groups. I’m a huge fan of Kate Braverman, Raymond Carver, Mary Robison, and Ellen Douglas. I also have been reading the series “The Art of…” on the craft of writing published by Graywolf Press. What's your best piece of advice for novice writers? Go to the page, become fluid. Then edit, edit, edit. Find writers you trust to give you honest feedback. Find writers who are supportive to work with. Work your poems or stories till they are honed. Read them out loud! Record them to hear yourself read them. Try reading them in different voice tones, edit as you read, see what your rhythm is. Immerse yourself in the poetry world. Meet other poets, be a sharing, collaborative connector. Please visit my website; under the Links dropdown you’ll see a page “Julene’s Poems” with links to my online published poetry. My two books are available on Amazon. I’d love to hear from you, and I have review copies available for No Father Can Save Her.